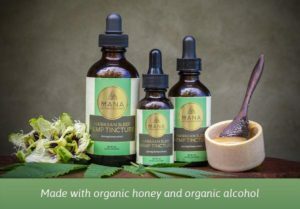 Hawaiian Sleep Hemp Tincture is a small batch mixture of phytocannabinoid-rich organic hemp extract with fresh Honaunau Farm grown passion flower, and a drizzle of Lehua honey in organic cane alcohol. This tincture delivers 150mg of hemp extract per ounce. It has a fruity flavor with a hint of sweet. A perfect elixir to take before bedtime. Available in 1oz, 2oz and 4oz sizes.